This paper was written for the Managing Projects & Teams module as part of my Master's in Digital Management at Hyper Island, Manchester (UK). This paper is a critical analysis of traditional and cutting-edge project management methods and principles. It will also explore what makes a project team effective based on literature and the author’s professional experience. Project management is the practice of initiating, planning, executing, controlling, and closing the work of a team to achieve specific goals and meet specific success criteria at the specified time (PMI, 2018). A project is a temporary endeavor designed to produce a unique product, service or result with a defined beginning and end undertaken to meet unique goals and objectives, typically to bring about beneficial change or added value (PMI, 2018). The management of such distinct production approaches requires the development of distinct technical skills and management strategies. In order to better understand the implementation of management practices into an actual project, one must examine methodologies in practice. This paper examines the traditional “Waterfall” methodology and an umbrella management philosophy known as “Agile”. The Waterfall model, commonly called the “traditional” approach, was one of the first project management methodologies that came into being. Originating in manufacturing and construction, the model inherited a highly structured and rigid approach. Inherited by enterprise software developers from other industries where, once a phase of production is complete, it was costly or impractical to go back and make changes. Project development following a waterfall approach is set up in stages, with each phase in the project’s life cycle taking place in a linear sequence (Bowes, 2014). All requirements gathering and design work is done before any coding takes place. Each stage is distinct, and generally finishes before the next one begins. These stage gates between each phase of the process to provide an opportunity to review requirements. At the end of the timeline, a fully completed product delivered where the customer gets involved. Waterfall remains the most popular software development project management methodology (Stoica, 2016). The linear nature of provides simplicity. Typically there is better documentation of the development process, with many potential issues discovered in the design phase, before investing in development. This makes Waterfall effective for non-complex, predictable projects with clearly defined goals. However, the heavyweight, plan-driven approach is not always suitable for aggressive, time-sensitive projects with no clear-cut requirements. The need for more flexible approaches ensuring faster time to market and accommodating regularly changing user requirements has driven the introduction of Agile software development. Agile software development is an umbrella term for a set of methods and practices based on the values and principles expressed in the Agile Manifesto (Agile Manifesto, 2001). These methodologies were developed to solve for the rigid issues of Waterfall and in reaction to ever more varied requests from clients. Contrary to the traditional Waterfall approach, Agile does not focus on heavy upfront planning, documentation, and design. Instead, the authors created a collection of values and principles. At its core, Agile is about the ability to create and respond to change in uncertain and dynamic environments. The Agile umbrella has many methodologies, some of the most notable being eXtreme programming (XP), Lean, Scrum, Kanban. While each methodology has strengths and weaknesses, they all share several core features of an Agile model such as an iterative, team-based approach to development and an emphasis on the rapid delivery of an application in complete functional components. Being iterative in nature, these methodologies encourage testing activities early on to improve the product quality, speed up the product release process, and make communication more transparent (Lotz, 2013). One of the core benefits of adopting an Agile approach is the powerful social aspect, stimulating human interaction at the workplace and team spirit (Stoica, 2016). In addition, the process helps teams focus on customers’ most important requirements as quickly as possible. With continuous feedback and frequent face-to-face interactions, the project team and stakeholders understand and prioritize the right requirements. Despite these benefits, the transition from a Waterfall approach to Agile is frequently blocked by a lack of ability to change the organizational culture (Stoica, 2016). Project management includes managing the team. Teams are groups of people embedded in organisations, performing tasks that contribute to achieving the organisation’s goals (West, 2012 p.27). If the team is not happy or properly directed, the project will face many challenges. If the team works effectively, chances of success are much improved, and life within the project is much easier for everyone involved. This section explores the organisation and dynamics within a team, and the key dimensions of effective teams. Susan Wheelan outlines four stages teams move through towards high performance, these include: dependency and inclusion, counter-dependency and fighting, trust and structure, and work and productivity (Wheelan, 2014). When groups form, there is a focus on establishing leadership and feelings of inclusivity. As groups progress through each of the four stages, they learn to quickly resolve issues, establish trust, and, at stage four, are able to focus the majority of their energy on goal achievement. Group development is not always linear, and it is rare for teams to experience stage four (Wheelan, 2014). It is therefore helpful to examine characteristics shown to facilitate group development. A study conducted by McKinsey (Keller, 2017) interviewing more than 5,000 executives reveal three key dimensions that can facilitate teams through the stages of development. These are: (1) alignment on direction, which involves a shared understanding of goals and the role of the team in getting there. West (2012, p31) and Haas and Mortensen (2016) suggest developing a shared mindset helps create alignment in today’s increasingly distance and diverse teams. In addition, a compelling direction can create team energy, orientation, and engagement (Haas and Mortensen, 2016); (2) high-quality interaction, which is characterized by open communication and a willingness to embrace conflict. Pentland (2012) identifies communication as the most significant factor to predicting a team’s success, focusing on the number and nature of exchanges among team members as the key element; (3) strong sense of renewal, which is an environment in which teams are energized because they feel they can take risks, innovate, learn from outside ideas, and achieve something that matters. To create a strong sense of renewal, teams require a supportive environment that provides the necessary resources for projects (Haas and Mortensen, 2016). It is also critical to develop mutual trust, where team members can rely on each other and support each other in their shared endeavor (West, 2012 p32). Developing these three dimensions is difficult to achieve in practice, and the author has experience in which they have been both implemented effectively and ineffectively. As an example of ineffective implementation, the author worked on a team at Hyper Island that attempted to increase group size midway through a project. At group formation, there was heavy focus on creating alignment on direction and high-quality interaction. The group of five original members developed a culture of trust and clear agreed-upon goals. This helped keep team members engaged and energized, and the group quickly progressed into stage three of team development (Wheelan, 2014). However, midway through the project timeline, the team began to collaborate with a complementary group without a conscious effort to integrate new members or revisit individual or collective goals. As a result, the team regressed into a pattern of counter-dependency and conflict, and the high performance that was previously achieved could not be regained by project resolution (Wheelan, 2014). Prior to Hyper Island, the author worked in an Agile environment with significantly more structure, definition of roles, and resources. Teams worked within a Scrum methodology where communication was frequent, consistent, and focused on team purpose. Team members collaborated across many projects, which helped establish trust and open communication, including constructive feedback. As a result, teams performed at a high level and members remained engaged with their work, as exemplified by regular emotional check-ins via online surveys, and low employee turnover. Project management methodology selection should be dependent on the organizational culture in which it takes place. The types of projects teams contribute to, whether rigid or flexible, can have a significant impact on the effectiveness of the tools and techniques utilized or selected. Ultimately, the success of a project will be dependent on the ability of a project team to execute. The author concludes this comes down to team alignment, the quality of interactions, and a sense of organizational support. Agile Manifesto (2001), Website. Available at: http://agilemanifesto.org, (Accessed: 30th May 2018). Bowes, J. (2014), “Agile vs Waterfall – Comparing project management methods”. Available at: https://manifesto.co.uk/agile-vs-waterfall-comparing-project-management-methodologies/, (Accessed: 6th June 2018). Haas, M. and Mortensen, M. (2016), “The Secrets of Great Teamwork”. [online] Harvard Business Review, June 2016. Available at: https://hbr.org/2016/06/the-secrets-of-great-teamwork, (Accessed: 22nd June 2018). Keller, S., Meaney, M. (2017). “High-performing teams: A timeless leadership topic”. [online] McKinsey Quarterly, June 2017. Available at: https://www.mckinsey.com/business-functions/organization/our-insights/high-performing-teams-a-timeless-leadership-topic, (Accessed: 24th June 2018). Segue Technologies. Available at: http://www.seguetech.com/waterfall-vs-agile-methodology/, (Accessed: 6th June 2018). Pentland, A. (2012). “The New Science of Building Great Teams”. [online] Harvard Business Review, April 2012. Available at: https://hbr.org/2012/04/the-new-science-of-building-great-teams. (Accessed: 6th June 2018). https://www.pmi.org/about/learn-about-pmi/what-is-project-management, (Accessed: 25th June 2018). Smartsheet (2018). “What’s the Difference? Agile vs. Scrum vs. Waterfall vs. Kanban”. [online] Available at: https://www.smartsheet.com/agile-vs-scrum-vs-waterfall-vs-kanban, (Accessed: 25th June 2018). Stoica, M., Ghilic-Micu, B., Mircea, M., Uscatu, C. (2016). 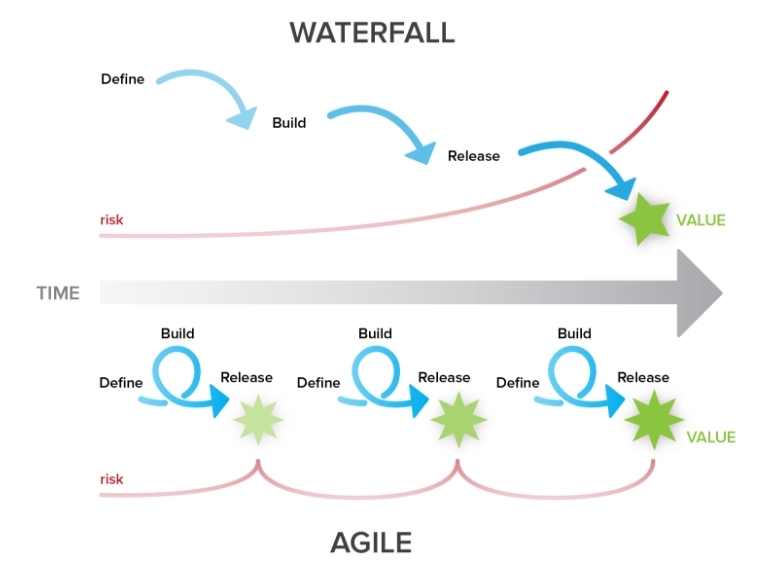 “Analyzing Agile Development – from Waterfall Style to Scrumban”. Informatica Economica, December 2016, vol. 20. Issue 4, p5-14. 10p. West, M. (2012). Effective Teamwork: Practical Lessons from Organizational Research. John Wiley & Sons, West Sussex, 2012. Wheelan, S. (2014). Creating Effective Teams: A Guide for Members and Leaders. 5th ed. Sage Publications, Inc.